Along with education and fellowship, department leaders will shop products and services offered by more than 500 vendors -- including Aladtec, the premier provider of scheduling software and workforce management solutions for public safety. 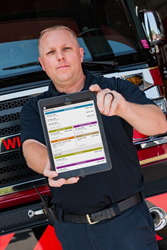 The Aladtec system easily handles the complex scheduling and unique rotation requirements common in fire service. Its features allow members to submit availability, request time off, initiate shift trades, and log overtime hours -- all from a smartphone, tablet or desktop. It helps leaders monitor and meet minimum staffing requirements, helps control overtime, integrates with payroll, and allows agencies to track certifications and licensing. Aladtec e-forms speed up rig checks and provide airtight documentation. Tuesday evening will also feature a special screening of TruTV's new American comedy series "Tacoma F.D"
Aladtec currently has 26 California departments using its software -- including CAL Fire's San Diego- and North San Diego County Fire Authority, NASA JPL in Pasadena, and Truckee Fire District. Nationwide, 2,200 Public Safety agencies use the platform.